THE Obanla of Ijesaland, High Chief Oyekanmi Ogedengbe on Monday 18th March 2019, defended the peaceful protest embarked upon over the weekend by a group of electricity consumers in the city of Ilesa to the authority of Ibadan Electricity Distribution Centre (IBDEC), to register their regrets and concern over the blackout in Ijesaland, high electricity bills and poor service delivery by the agency. The traditional High Chief made this fact known to Journalists at a radio press briefing, contrary to the reports and allegations made by authority of the IBEDC to the police over the public protest in the ancient Ilesa city. The IBEDC regional communication officer, Mrs. Owoeye who spoke on the issue in an interview, affirmed that reports came to her in Osogbo that a group of protesters in Ilesa carrying dangerous weapons attached their offices in Isokun and Oke-Omiru area of Ilesa town, threatened the business manager, assaulted the staff and forced them to run way for safety. The protesters she said, took laws into their hands and did not follow the proper channel to express their grievances to the authority for redress. The IBEDC authority she said, officially informed the the police of the incident and also reported the case to the Royal Majesty of Ijesaland, Oba (Dr.) Gabriel Adekunle Aromolaran(II). 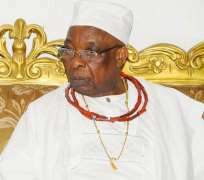 The King has summoned his Chiefs to an emergency meeting in his palace to settle the matter with instructions that appropriate measures must be taken to restored light back to all communities in Ijesaland affected by the blackout. Electricity consumers in Ilesa since privatization of the company and government change from analogue to digital meter reading a few years ago, prefer the pre-paid meter system and want government to make the pre-paid meters is affordable by all and must be made available for installation in homes in the entire kingdom. Presently, with the mafia perpetrated by agents and the corruption involved in the distribution and sale of pre-paid meters in Ilesa, many poor and faithful consumers of electricity in Ijesaland are deprived of this important necessity of life which is the sole responsibility of the government. Consumers said they are fed up with the embarrassment of paying high electricity bills due to improper metering of electricity consumed in homes by users. A member of the Nigerian Bar Association based in Ilesa and touched by the chain economic and social effects of the blackout to the people, has threatened to drag IBEDC authority to court over the incident. As of Monday, street junctions in the city of Ilesa were littered with black specs of burn fires mounted by protesters, entry to the daily operated Atakumosa market was closed, people went about their normal duties with fear, a large number of the people stayed at home and the streets were almost empty . The incident brought great fear and panic to the people, inhabitants are praying and watching for a peaceful solution to the unfortunate crisis. The kingdom shares its electricity grid with Efon-Alaye town in Ekiti state which shares boundary with Ilesa and the electricity provided by government is also consumed by people and communities in the six local government areas that make up the ancient kingdom.